If you are someone who believes in the European Union and wants Britain to stay in, you cannot ignore this issue, because the European Union was not designed to accommodate two classes of members, where one group, the majority, is rapidly integrating to try to make the single currency work, and the other group, particularly Britain, doesn’t want to be part of that ever-closer union. And our treaties don’t provide for that. If we don’t resolve this issue, it’s going to cause more and more problems for Britain’s economic national interest. So we need to resolve it. 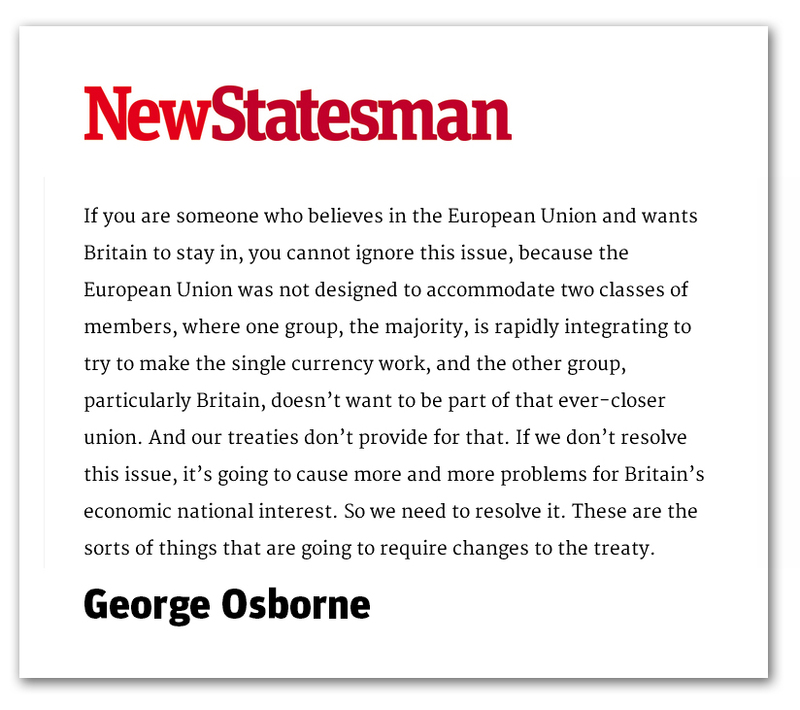 These are the sorts of things that are going to require changes to the treaty.Acknowledging that we cannot get a treaty change before 2017, Osborne goes on to argue that “we need to work out what we can agree in terms of what Britain needs and how Europe can be reformed and then work out the best vehicle for delivery”. In his view, he adds, it is going to require things that are legally binding and irreversible and, therefore, almost certainly treaty change, certainly on this issue around the relationship between the Euros and the non-Euros. “This is a problem that needs resolving, because otherwise British membership is going to become increasingly difficult”, he concludes. And there we have the Chancellor admitting that the government is looking at an “associate membership” relationship – without it being labelled as such – with the core group inside the eurozone and the UK and others on the outside. However, this is not the first time Osborne has entered the fray. In May of this year, the Telegraph’s Iain Martin was arguing that there was “a genuine chance here of securing a historic prize, the fabled two-tier European Union, with an inner core of countries in the eurozone integrating more closely (as the Germans want) while the outer tier gets a looser arrangement that still preserves the single market”. He was at it again in August when he supposedly “set out plans a two-tier Europe” that would “protect British taxpayers and the City of London from decisions made to save the Eurozone”. Britain needed a “permanent new settlement” that would protect it from Eurozone integration but guarantee access to the single market, the Chancellor then said. Now as then, rather as we expected, there is no acknowledgement that the structure of the new “two-tier Europe” has already been settled and that the UK is merely conforming to an outcome which the “colleagues” have been proposing for some many years. But what we are getting are some clues as to how public perception is to be “managed”. From a source close to Open Europe, we learn that an attempt will be made to redefine the EU as is stands as the “market”, while the core will be labelled “political Europe”. The intent will then be to argue that the deal that would make it an essentially semantic question whether we are in or out. And if Poland, Sweden, Norway, Denmark and Switzerland come in alongside the UK as associate members, outside the eurozone but with equal voting rights on market issues, we will be told that we will be effectively out of the EU. To further add to the deception, Open Europe itself wants to position the deal as “safeguarding non-eurozone states’ rights”, somehow making out that associate membership will prevent the eurozone legislating on City affairs. This is a deception that George Osborne seems to be content to go along with, so much so that the Financial Times sees his call for a treaty change as “a means to prevent eurozone countries from ganging up against Britain to discriminate against the City of London by rigging the rules of the single market”. Although Mr Osborne was also making that point in August, the point here is that he cannot be unaware that most of the financial services legislation affecting the City is of international origin, prepared by or for bodies such as the G20 and the FSB, and that which is currently of EU origin is due for revision. By the end of the decade, almost all important legislative instruments will come from global bodies. Presenting treaty change in such terms gives a positive spin to something that would otherwise look (and, in fact be) a second best. And if it is seen to be a result of Mr Cameron’s “negotiations”, enough people may be taken in to give the remainers a victory in the referendum. Certainly, we are not going to get any help from the media, when we have the likes of the Telegraph’s editorial tell us that Juncker’s “fair deal for Britain” was “an acknowledgement that the prospect of a Brexit is at last being taken seriously in Brussels”. Never mind that the arrangements have been on the stocks since 2013. The narrative adopted by the newspaper points to the new treaty being something new. Thus the editorial tells us that David Cameron “wants to negotiate a new relationship with the EU whereby we can retain our membership but not be part of the developing single state that Europhiles always deny is the ultimate goal”. Only now, with Mr Juncker’s state of the union address, are we led to believe that he was “prepared to recognise the reality that Britain did not want to participate”. The deal is that the UK in turn should not stand in the way of those EU members states eager to embrace “ever closer Union”. In the view of the Telegraph – totally oblivious to the developments outside its narrow, London-centric sphere, “Mr Cameron may have detected the first glimmerings of a deal”. Currently though, even Andrew Duff is joining in, arguing that the rest of the EU can give the British what they seem to want by pressing on themselves to federal union. If the UK were to choose another destination, such as partial or associate membership, so be it, he says. But it has no right to subvert the European project for everyone else. And so, from October 2013 when we were flagging it up, associate membership is emerging as a central part of the EU debate. Perversely, in December of 2012, The Times was reporting that: “A group of senior politicians in Brussels is to propose ‘second-class’ EU status for Britain in a dramatic shift in thinking by the strongest supporters of a united Europe”. They were, said The Times, to suggest that the UK should become an “associate member”. The new category of associate membership, we were told, would give Britain the option of staying attached to the EU to prevent it quitting altogether if, as some expect, the Prime Minister’s renegotiation fails to satisfy voters or Eurosceptic Conservative MPs”. For the record, the newspaper was saying at that time that the European Commission had pledged to publish a new treaty in 2014 to put in place the next stage of economic and political union. That, as we know, was delayed after Mr Cameron’s Bloomberg speech, in which he threatened to hijack the treaty to force “reform” concessions. But now the same treaty is back on the agenda, bringing with it “associate membership”, and we will be expected to believe that this is something new. Nevertheless, we also see Matthew Parris writing in the New Year (2013), noting that many Times readers took the view that associate membership sounded like a helpful suggestion. So, he noticed, did the arch-Eurosceptic Tory MP John Redwood in his blog, “a response that I think he’ll come to revise”, Parris wrote. The balance of The Daily Telegraph’s online response was more hostile, a common view being that Britain shouldn’t waste time with second-tier membership, but simply quit. Parris predicted that the bulk of British eurosceptic opinion would in time swing behind the Telegraph readers’ view. For that, he predicted, “will be the final effect of published proposals for the middle way of a ‘trade-only’ second-class membership”. Examined in detail, he said, it will lose its allure. Before the next general election, therefore, the debate will polarise towards a simple choice between staying as a full member and leaving. But, in this post-election period, full membership will no longer be an option, as it will require joining the euro. It seems, therefore, that we’ll just have to leave.